Tweeting pic is very easy with iPhone 5. Here is a simple step step by procedure to tweet your photo directly from iPhone 5 camera roll. Step 1: Move to your to your camera roll and select a photo. Step 2: At the bottom left hand corner you could find an arrow icon. Just tap that icon and you will get a menu. 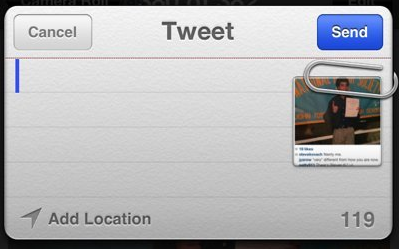 Step 3: Choose the “Twitter” in the row and a menu will shows up with the selected photo attached in the top right corner. Step 4: Done, now you can type your tweet, tap Send.